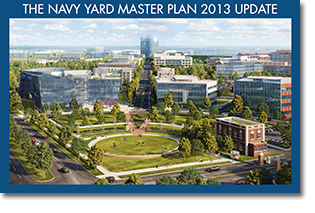 In 2004, the Navy Yard commissioned Robert A.M. Stern Architects and a team of real estate, development, planning, and design professionals to produce a master plan. The Master Plan provides a series of initiatives and actions to create a vibrant mixed-use campus.The Plan's vision includes environmentally friendly workplaces, notable architecture, industrial development, great public spaces, waterfront amenities, improved mass transit, and residential development. In 2013, the Master Plan was updated, building upon the successes to date, with an expanded vision of what's to come. Future development at the Navy Yard continues to focus on creating unique spaces for employment—expanding businesses, adding residential development, and enhancing streets with ground floor restaurants and retail. As the Navy Yard grows, its development team will continue its commitment to high-quality design, historic preservation, and sustainability. 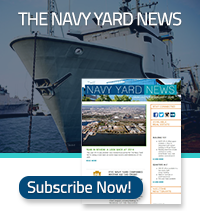 At full build-out, the Navy Yard will support up to 18.5 million square feet of development, 30,000 people, and over $3 billion in private investment. With this plan as a guide, the Navy Yard is planning for its bright future.